A popular sit up bench for firming and shaping the abdominal, back, chest, arm and hip muscles. Get your gym at home and streamline your figure with only a few minutes of training per day. With multiple adjustments the We R Sports Sit up bench allows you to focus on many muscle groups. You're worth it! 【MULTI-PURPOSE】A popular sit up bench for firming and shaping the abdominal, back, chest, arm and hip muscles. Get your gym at home and streamline your figure with only a few minutes of training per day. 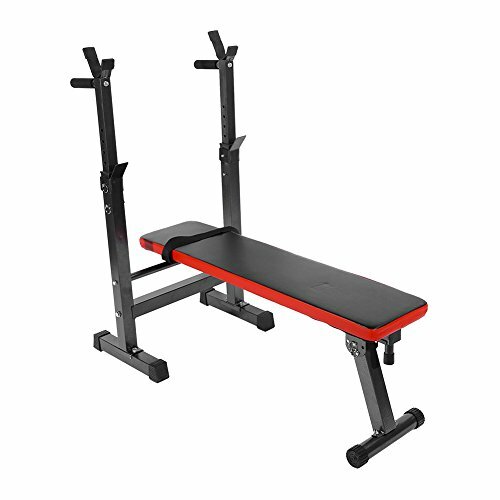 【HEIGHT ADJUSTABLE】With multiple adjustments the We R Sports Sit up bench allows you to focus on many muscle groups. Height-adjustable barbell rack to meet different needs. 【FOLDING DESIGN & SPACE-SAVING】The bench can be folded away in just a few easy steps and stores in a relatively small space after use. Can be folded into compact size to save space. 【COMFORTABLE & SAFE】The bench has a padded mattress, comfortable padded bench covered in hard-wearing leather. With sturdy non-slip footing for extra safety. Ideal for home gym, personal training or outdoor cross fit training. 【STRONG STRUCTURE & GREAT LOAD BERAING】Strong powder coated solid steel 1.5mm thickness guarantee great durability, The maximum user weight is 100kg.